I am very far behind on posting my finishes. I guess that means I have been sewing, not blogging. Which is cool. 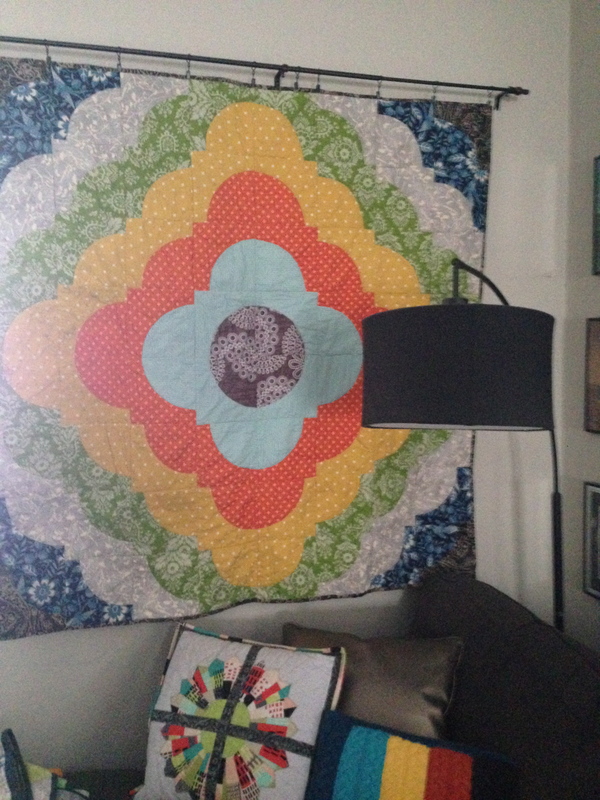 I finished this quilt as a living room wall hanging a few weeks ago. This is from A Quilter’s Mixology – the medallion quilt with a couple more rows and columns. It was pretty easy, but I am done with curved piecing for a bit. It definitely has a trippy vibe, which goes with our collection of framed LPs on the perpendicular wall. I was going to go scrappy, but decided the quilt would have more impact with using fewer fabrics. Most of the fabrics are larger cuts from my stash, but I did buy some new fabrics for this quilt (the Heather Bailey green, the cotton+steel yellow, the Joel Dewberry light blue). This quilt did get some black marks in it in the wash. So maddening. Don’t know where they came from and they don’t come out. But you can’t really tell unless you really look for them. So I left it on the wall. Too much time invested to not hang it. So there it will hang until I want something else up there. That is what I love about quilting.